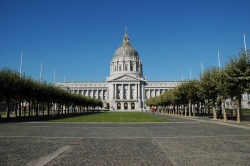 San Francisco Civic Center is home of major government and cultural institutions. To the north is the Tenderloin. BART (East Bay/SF Airport) and Muni Metro trains run under Market Street. In the area, Civic Center/United Nations Plaza Station is the main stop for both systems. F-Market & Wharves streetcar stops along on Market Street. The nearest Caltrain (Peninsula/San Jose) stop from Civic Center is 4th & King Station. Muni 47 and 83X buses as well as Muni Metro Judah and Third Street lines provide connection between Caltrain and Civic Center. From either the Ferry Building or Pier 41, transfer to F-Market & Wharves streetcar to reach San Francisco Civic Center. Downtown is served by various bus systems from the North Bay and the Peninsula. Ford GoBike operates self-service bike share stations in the Downtown area. This page was last edited on 27 November 2018, at 03:04.